YANGON, Myanmar (CNS) -- Cardinal-designate Charles Bo's appointment as Myanmar's first cardinal is seen as support for his efforts to push national reconciliation, peace, justice and freedom as his people struggle with religious and ethnic tensions and other problems. The new position draws attention to Cardinal-designate Bo's country, formerly Burma, which is going through a transitional period and is gaining a new status in the world scene, said Spiritan Father William Headley, an American sociologist. Father Headley worked with Cardinal-designate Bo on activities of the U.S. bishops' Catholic Relief Services in Rome, Myanmar and other places in Asia. He noted Cardinal-designate Bo's dedication to justice and peace. "He will have a chance to apply that (world status as cardinal) in his own country with some of the justice concerns there and it could be an example -- a model -- to some places in Asia struggling with the same kinds of questions," Father Headley told CNS. Cardinal-designate Bo, 66, also chairs the Office of Human Development of the Federation of Asian Bishops' Conferences and is a member of the Pontifical Council for Culture. In his pastoral letters, he "has been very sympathetic to the Muslim minorities" in Myanmar, Father Headley observed. He said the cardinal-designate's way of helping ethnic and religious groups of people in his country offers an example "at a time when we're approaching our celebration of 'Nostra Aetate,'" the Second Vatican Council's 1965 Declaration on the Relation of the Church to Non-Christian Religions. In his message for the New Year, Cardinal-designate Bo decried "violence toward our Muslim brothers and sisters" and other groups, saying these did not only kill people and destroy buildings, but also led "to the death of fraternity and the destruction of brotherhood." He stressed relationships must be restored to achieve true peace. Father Gabriel Htun Myint of Myanmar said he believes the bishop's ministry among the Kachin people and now in Yangon among the "most troubled" ethnic minorities, and the fact that he is well-versed in their languages, contributes to his enthusiasm to work for national reconciliation. His creation as cardinal is "recognition of the coming of age of the church of Myanmar" that celebrated its 500th anniversary in 2014, said Filipino Claretian Father Samuel Canilang who directs the Institute for Consecrated Life in Asia. Fifty-two Myanmar priests, religious and lay pastoral workers have graduated from the institute over the years. 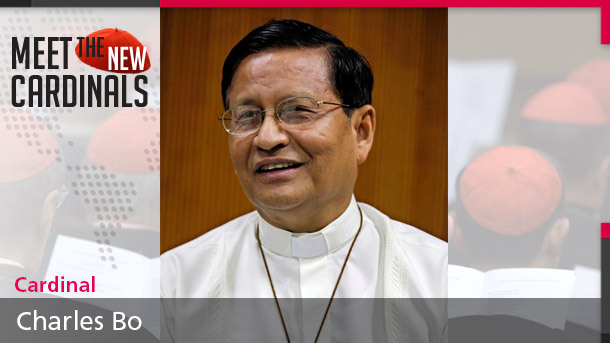 In separate interviews, Fathers Canilang and Headley noted Cardinal-designate Bo's calm disposition, "even while he speaks out against injustices and advocates for democracy and rights of all people," Father Canilang said. The cardinal-designate is a "gentle man" who is "not excitable, and I think he'll be a force for stability in his country as it tries to move forward," Father Headley said.